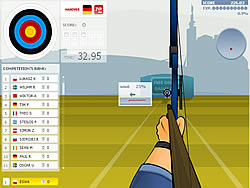 Shoot the targets with your bow n arrow as you move up in the tournament and the target gets farther. Move your Mouse around the circle are to the left to activate your bow. Click on it to shoot.